Replacing the cabin filter is a good idea to do every couple of years because it can get clogged up and severely diminish your heating and air conditioning. While I was under there, I also decided to lube up the bushings on the blower motor as they were starting to make noise after long trips. 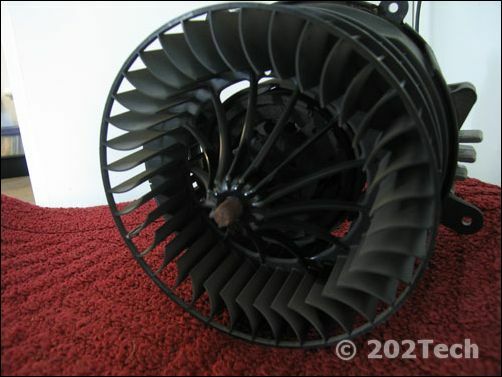 The part number for the filter is 210 830 08 18. It usually costs around $30 but may be cheaper online. Step 1: Remove the passenger side knee bolster. 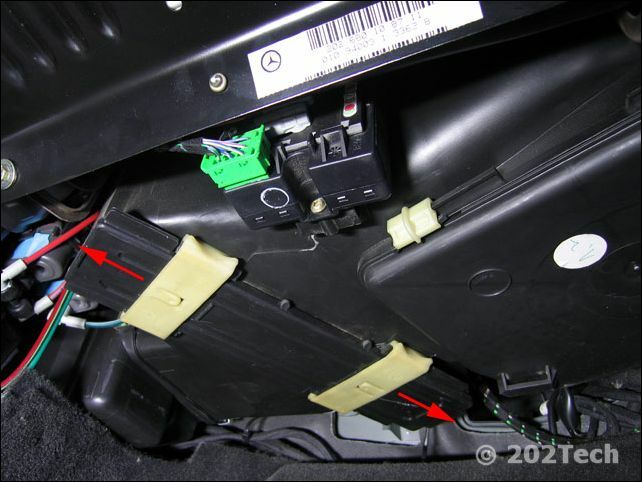 This is done by unscrewing the three Philips screws that are under the dash right at the edge where the glove box and the bolster meet. 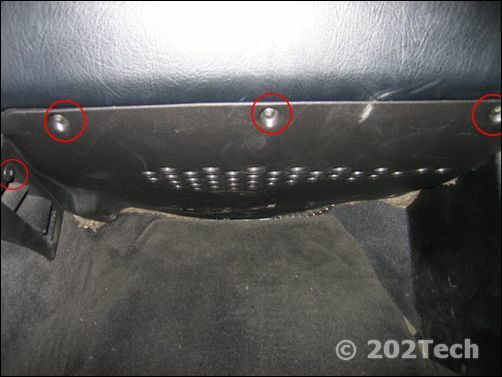 There is also an air louver on the console area that needs to be removed by turning the plastic screw exactly 90 degrees. Slide the knee bolster (lower dash cover) backwards and it will drop out. See the picture below. 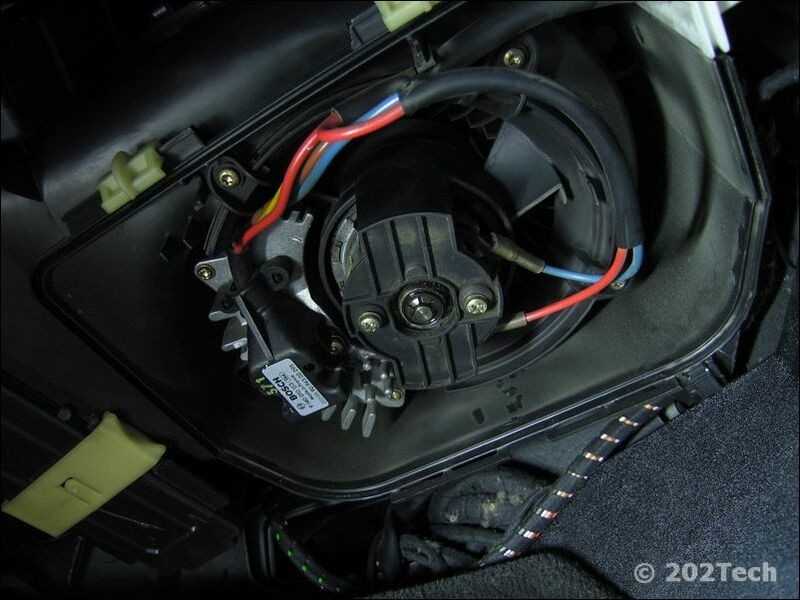 Step 2: Once the knee bolster is removed, you can see the cabin air filter cover, and also the blower motor cover. I will continue on with the instructions to remove the cabin air filter. Simply slide the two locking clips to the outsides and pull the cover off. Step 3: After the cover is removed, the filter can be pulled out. Note the orientation of the filter as you remove it so that it can be put back in easily. Once the new filter is in, simply put the cover back on, and slide the clips toward the middle. 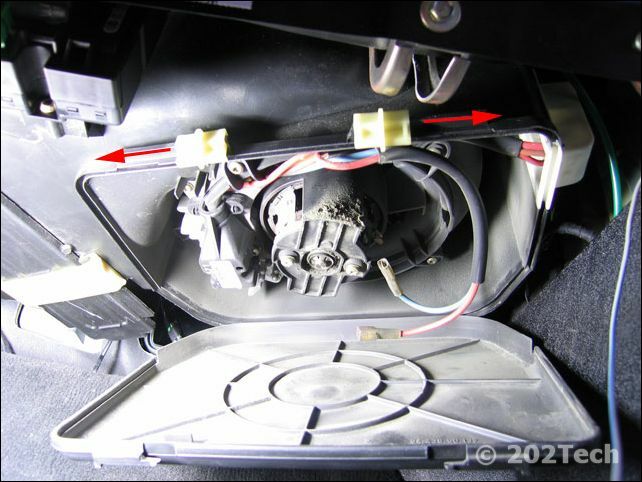 Step 2: With the knee bolster still removed, on the right of the cabin filter, there is a squarish cover. This cover contains the blower motor. Slide the clips from towards the middle of the unit. And then pull outward to remove the cover. There will then be several wires. On the inner part of the motor itself, pull off the Red and the Blue wires from the motor. Step 3: From here, depending on the year, the number of screws, and the orientation may vary. My particular model had 4 Torx screws to remove the actual unit. There was a small little box of wires (this is the heater regulator) that also had to be unscrewed from the fan unit. Once these screws were removed, the unit was free to come out of it's housing. Step 4: Now that the unit was out, I cleaned it up with compressed air, blew all of the dust off. I then used oil to lubricate the bearings on either side of the motor. Step 5: Installation is reverse of removal. 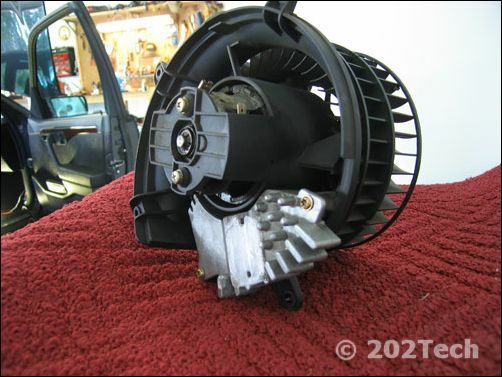 Be sure to remount the heater regulator as it needs the heatsink to cool it correctly. Once the wires are reattached, it should look like the picture below. Reinstallation of the knee bolster is reverse of removal also. Make sure to slide the two clips on the middle and back of the bolster into their respective slots. Then rescrew the three screws. Finally, reattach the air louver.